Dominic’s Abbey lies to the southeast of the Rock of Cashel and was founded in 1243 by Archbishop David Mc Kelly and was dedicated to St. Dominic. David Mc Kelly is first mentioned as Dean of Cashel and then as a Dominican Friar. He became Bishop of Cloyne and in 1238 he was appointed Archbishop of Cashel. He died on 2nd March 1253 and was buried in the Chapel of the Apostles on The Rock. It has been suggested that the carving of the bishop which is now on Miler Mc Graths tomb was originally on the tomb of Archbishop Mc Kelly. 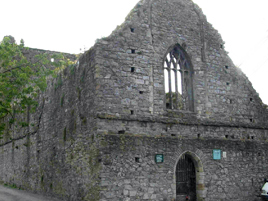 Dominics Abbey was supplied with monks from the Friary in Cork and in 1289 and 1307 General Chapters of the Order were held in Cashel. The abbey is cruciform in plan with a high tower over the crossing.